Romanian Associations of Banks (RAB) / Projects / WHERE IS FINANCIAL INTERMEDIATION HEADING TO? In 2018, the Romanian Association of Banks (RAB) has presented a survey called “The Economic and Social Impact of the Romanian Banking Sector”, drawn up by PricewaterhouseCoopers, survey which has shown the fact that, during 2012-2016, the banking sector contributed with 4.2% to Romania’s cumulated GDP, i.e. with about €30 billion, when taking into account its direct, indirect and induced effects upon the economy. The positive impact upon the GDP has been generated by banking services (direct effect), by more production of the banks’ suppliers in Romania and more production of their suppliers, as the result of the acquisition of goods and services performed by banks (indirect effect) and by the additional consumption of the banking sector’s employees and of the employees of all the suppliers along the value chain, generated by their spending the wages received in the economy (the induced effect). The PwC survey has shown that for each 1 euro of the gross added value generated by the banking sector, another €0.33 in added value is generated along the supply chain and another €0.22 is generated by employees’ spending their money in the economy. The impact is significant also as regards the number of staff hired by the banking sector, this number being almost double if we are to take into account the indirect and the induced impacts as well. Thus, during 2012-2016, the banking industry hired directly an average of 57,887 people and contributed to the hiring of another 51,221 in the rest of the economy, as such generating 109,108 jobs in total. The survey mentions that for each person hired by the banking sector, another 0.54 persons are hired in the rest of the economy due to the indirect effect and another 0.35 persons are hired due to the induced effect. Moreover, the contribution generated by the banking sector to the state budget amounted to about €5 billion during the period mentioned. The role of the banking sector in the economy is very well known or, at least, it should be fully understood. Banks provide financial intermediation by raising deposits and granting loans. Via lending, banks help the funding of the needs of natural and legal persons that plough back this money into the economy via consumption and investments. By raising deposits, banks protect the population and the companies’ savings. The increase in consumers’ available income following their access to loans leads to more consumption, more net wealth and less social disparities. We are of the opinion that it is in the authorities’ interest to adopt measures leading to the mitigation of the disparities among classes, with a view to enhance economic welfare, cut migration and improve demographics. The mentioned survey showed that there is a strong direct correlation between the newly originated consumption loans and the development of consumption expenditure just like between the newly originated real estate loans and the development in the number of residential units. The correlation between the newly originated consumption loans granted to households and the level of monthly expenditure for consumption stands at 0.91, which reveals the fact that, via lending, banks spur directly consumption in the economy and implicitly economic growth. Similarly, the correlation between the volume of real estate loans granted to the population and the number of residential units stands at 0.94, which shows the fact that, via real estate loans, the population boosts the increase in the number of residential units directly. There are over 450,000 families who live in houses bought with credit, which means about 10% of the Romanians. 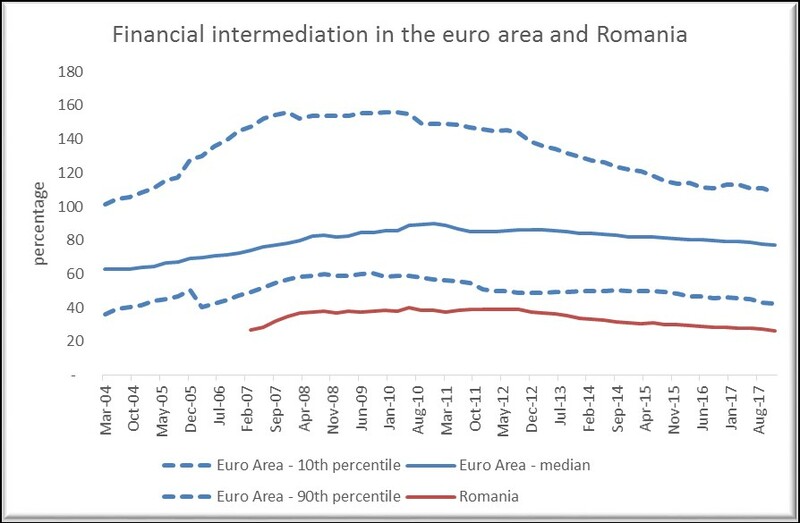 In Romania, financial intermediation – calculated as the weight of non-government credit against the GDP – went down last year to 26.4%, standing at the level of the year 2006. We rank last in the European Union when it comes to the level of financial intermediation and also when it comes to economic welfare and wages. That is why we have to ask ourselves how to avoid the adopting of measures which lead to more social disparities. We think that we should all contemplate the Romanians’ long-term interest. The authorities should foster – via implemented measures – the enhancement of financial intermediation. At the end of last year, the outlook for 2018 regarding the developments in the Romanian banking sector was optimistic; but, certain factors have occurred in the meantime, altering this perception. We have been witnessing the materialization of the risk bankers have been talking about in the last two years: legal risk. And so, our question refers not so much to how to go on lending or under what conditions, but rather whether to continue lending to some customer segments or not, taking into account the cumulated impact of some initiatives submitted to Parliament. All these initiatives mean costs for the banking industry. The paradox is that this takes place in the European state which has the lowest level of financial intermediation in the entire European Union. We need to have a fair framework allowing us to operate – in a balanced, competitive environment – with the players as well as with the new player categories that will enter, step by step, certain areas of financial services. We are all accountable for maintaining a climate of trust which, if affected, can turn – instantly for that matter – an opportunity into a risk, especially since we are in the presence of financial stability so much needed for the equilibrium of the whole economy. The Romanian Association of Banks does not support the amending of G.O. no. 13/2011 arbitrarily limiting the annual percentage rates (APR) charged by credit institutions. Moreover, we do not support the legal initiative on limiting the amounts of money recovered from consumers by claim recovery companies, as this would allow the going up of NPLs. The banking industry is extremely worried about the attempt to put restrictions on interest rates as this action breaches the principle of contractual freedom and the principle of the contracts’ mandatory force, while breaching at the same time the non-retroactivity principle of civil law – due to the proposal that the new provisions should be applied also to the outstanding loan agreements concluded in the past. In addition, the competition law sets forth that product prices and service & work tariffs shall be determined freely via competition, based on supply and demand. The statements launched publicly that there are many European states which in their countries use such interest rate restrictions function of the statutory interest rate or function of the Lombard rate have no ground. The situation across the European Union Member States shows that 14 countries out of 28 states have no interest rate restrictions. In the 14 states with interest rate restrictions, no restriction is linked to the monetary policy rate; in 10 countries the restrictions are linked to imposing an APR multiplier, the maximum cap being 292% in the UK. Imposing an interest rate limit of 2.5 times the statutory interest rate (the monetary policy rate) could lead to a severe drop in lending to households, with the direct effect of less welfare and with negative effects across the whole economy. If interest rates on loans are restricted, the access to lending of higher-risk consumers will be limited as well. There is a risk that the loan demand migrates to other lending types less regulated or not regulated at all or that it even migrates to other markets, via online loans granted by different foreign operators – case in which consumers will lack the protection of the Romanian authorities. We could even witness the request for additional collateral when applying for a loan. Additional pressure will be put on the real estate market, with negative effects on the population’s wealth. We could even have higher costs for corporate loans. Limiting interest rates on loans by linking the APR’s highest level to the statutory interest rate will affect the authorities’ efforts to counteract inflationary effects. And, we cannot help asking ourselves what will happen with the interest rates on loans if the monetary policy rate is around zero? And how can banks remunerate deposits and how can banks remain profitable under such circumstances? If these restrictions are enforced, we will witness a drop in interest rate income, thus affecting profitability, a situation which could lead to the harming of the banking sector’s stability and to potential massive capital outflows. The coming into force of such an initiative could bring about, at individual level, more severe capital/liquidity requirements in parallel with a drop in capitalization due to balance sheet deterioration. We consider that Romania needs professionals in all fields, experts who can perceive in an adequate manner the primary effects but also the secondary effects of the measures proposed. We need predictability and stability and not periods turbulent from a legal point of view. The primary effects of the law drafts on interest rate restrictions, on limitations of the recoverable amounts of assigned receivables and on the elimination of the writ of execution character of loan agreements have already been seen in the public’s expectations and in their perception of the banking sector. These law drafts permit the creation of unrealistic expectations. The banking community has published a detailed impact analysis drawn up by KPMG so that all decision-makers and the public at large understand not only the first instance impact but also the second instance impact. The KPMG survey shows the fact that both the individual and the cumulated impact of the three law drafts on interest rate restrictions, on limiting the recoverable amount of assigned receivables and on eliminating the writ of execution character of loan agreements could lead to a slowing down of economic growth, a drop in consumption and investments and a drop in the state budget income, besides other effects that will affect consumers in a direct and prompt manner. The lack of legal predictability could have negative consequences on the business environment and on investments. On the one hand, as regards the legal proposals on interest rate restrictions and on the elimination of the writ of execution character of a loan agreement, the KPMG survey shows that a potential shrinking of lending to consumers by 5% following the going down of credit institutions’ capacity to finance the private sector, is estimated to bring the shrinking of consumption by 1.39%, of investments by 0.17% and of the GDP by 1.80%. Regarding the legal proposal on limiting the recoverable amount of assigned receivables and taking into account the potential of diminishing credit institutions’ capacity to finance the real economy, in conformity with the estimates, a potential 5% reduction of lending to households and to economic agents could lead to the shrinking of consumption by 2.19%, of investments by 0.27% and of the GDP by 2.84%. On the other hand, the cut in the NPL rate to 3% could generate for credit institutions additional capital amounting to 6.3 billion lei, money which could support an additional loan volume of 47 billion lei. The information available for this survey is limited to publicly available information from official sources.